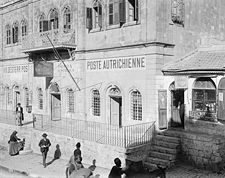 Austria and other European nations maintained an extensive system of post offices in the Ottoman Empire, typically motivated by the unreliable postal system of the Ottomans. For Austria, the practice started in 1748 with the establishment of a post office in Galata outside of Istanbul, and eventually extended to dozens of locations throughout the Balkans and the eastern Mediterranean. Beginning in 1863, stamps of Lombardy-Venetia were used, but after the losses of these areas in 1867, Austria had to issue special stamps; in appearance identical to Austrian stamps of the period, but denominated in soldis and florins. In 1886 this was changed to paras and piasters to match Turkish money, first by surcharging the existing stamps of the offices, then regular Austrian stamps. Stamps printed specifically for the offices resumed in 1906, by using Austrian stamps missing the denomination (at this point the denomination of Austrian stamps was printed in a second step), and the Jubilee issue of 1908 included the same designs denominated in piasters. While early issues are not common, the volume of mail by the end of the empire was such that both used and unused stamps are still commonly available.